Information: A Hungarian Dance and Music Camp. Barátság is Hungarian for "friendship." Since the summer of 1982, Barátság Hungarian Dance and Music Camp has been treating it's participants to a unique opportunity to immerse themselves in a week of intense and enjoyable learning from dancers and musicians chosen from among Hungary's finest professionals. The Camp was conceived of and founded by Americans, Howard Franklin, Sue Foy and Mary Wallace (now Mary Wallace Tobak) with the help of an American-Hungarian, Éva Kish, all of whom were intensely interested in learning Hungarian folk dances and bringing the experience to the United States. Over the ensuing years, the Camp has featured such well-known artists as dancers/choreographers, László Diószegi, Ágnes Gaûg, Zoltán "Batyu" Farkas, Péter Lévai, Sándor Michaletsky, Ildikó Németh, Szilárd Szabó, Zsolt Szilágyi, Ildikó "Fecske" Tóth, Marianna Újlaki, Zsuzsa Vince, and Zoltán "Zsura" Zsurafsky; and musicians/bands such as Kálmán Balogh, András Berecz, Béla Halmos, Jártató, Méta, Ökrõs Ensemble, Somogy, Téka, Tilinkó, and Újstílus (pardon any omissions - they are unintentional). Barátság has grown since its beginnings, from a cozy 45-member event to a camp of over 140 participants. Campers come from all over the United States and Canada, and has even drawn participation from Norway, Switzerland, and Holland. The Camp has also grown over the years to accommodate families, offering a now well-loved Children's Program which gives the children of the camp the chance to not only explore the natural wonders of the Redwood forest with area experts, but also the opportunity to complete many projects in arts and crafts as well as participate in their own classes of Hungarian folk dances and folk games. 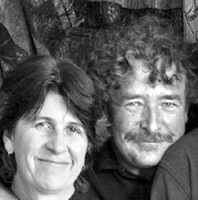 Barátság has been under the directorship of many individuals, including Howard Franklin, Sue Foy, Heidi Barthelemy, Roo Lester, Sally Confer-Miller, Julie Lancaster, Jeff O'Connor, and now, Ferenc and Mary W. Tobak. Mary, as one of the founding directors, pushed early on to make the camp a dance and music camp. As many know, the musicians have been an integral part of the camp since the second camp in 1983. In recent years, the camp has come under the influence of Mary W. Tobak and her husband, Ferenc Tobak. Ten years ago they moved to San Francisco from Hungary and immediately became involved in the camp. Mary was quickly invited to resume her duties as Director and together with Ferenc effected a definite influence on the scope and direction of Barátság. Ferenc brought his years of professional experience to the camp and in the first year of his attendance introduced the quality, well thought out programming for the after dinner entertainment and, more recently, the Introductory Concert held on the first night of camp. It was through the direct efforts of Ferenc and Mary that Téka made their first appearance in the United States in over a decade. In 1993 the Symposium was not interested in having Téka at their camp and by inviting Téka, Barátság embarked on a new era of selecting its own staff from Hungary, rather than relying solely on the staff chosen for the Symposium. The first year, 1996, Ferenc supervised the music lessons. It also marked the first time there was a concerted effort to ensure that the musicians and singers were learning the same material being taught to the dancers. This approached was so well received by the students that it has been the standard for camp ever since. Barátság 1997 (Szilárd Szabó, Ildikó Németh, Téka) was the single most successful camp (in terms of sheer numbers) in the history of Barátság. This year, Barátság 2000 appears to be offering an equally promising all-star lineup with the return of Szilérd and Ildikó, accompanied by none other than the legendary (there is no better word) Sándor Csoóri with Gergö Koncz, László Mester, Róbert Doór, Sándor Csoóri, Jr., and Erika Juhász. You have to know that that it took many years filled with numerous phone calls and personal visits to get Sándor to finally agree to come to Barátság. To get an artist like Sándor to teach at Barátság should be the greatest treasure for all those interested in the music and dance of Hungary. To have him in the company of this lineup of outstanding musicians and dancers should make Barátság 2000 the ultimate of camps. After the 2000 camp, Barátság Hungarian Dance and Music Camp closed its doors.